Some mornings, waiting for the T just to find it's packed full of people and you have to wait another 10 minutes for another train and hope there's space available, just gets old. Add in some rain and snow, and it's downright infuriating. So there I was, tweeting my frustrations from my local MBTA station, when lo and behold, the cheerful team at Virgin Atlantic appeared! After my tweet, the Virgin Atlantic team sent me a direct message through Twitter from their @VAAintheUSA account, asking if I'd like a little cheering up. They called it #FITFOO - Flying in the Face of Ordinary. 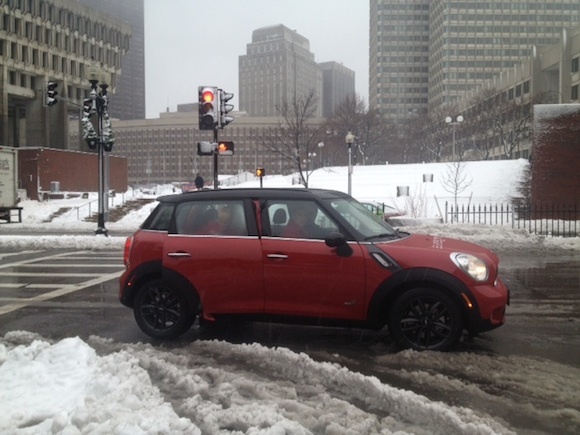 Having never been disappointed with Virgin Atlantic's campaigns in the past, I opted for a little lift in my day and soon enough, a red Mini Cooper showed up to transport me to my meeting in the Back Bay. The Virgin Atlantic marketing team and Cabin Crew will be spreading the love this week in Boston, while promoting our new campaign, Flying in the Face of Ordinary. #FITFOO. Using social media channels, the VA team will look for those having a dreary, ordinary or otherwise 'grey day' and need a bit of FITFOO in their lives. From there the teams will make special deliveries. Virgin Atlantic kicked off the campaign in Washington, D.C. and handed out everything from cupcakes and coffee to a new pair of Hunter rain boots! The airline crew will be in Boston through Thursday, making special deliveries to Bostonians having mundane days. All you need to do is tweet your woes with hashtag #FITFOO, and follow @VAAintheUSA on Twitter. You can use hashtag #FITFOO to track the crew's whereabouts and see if they're near you! 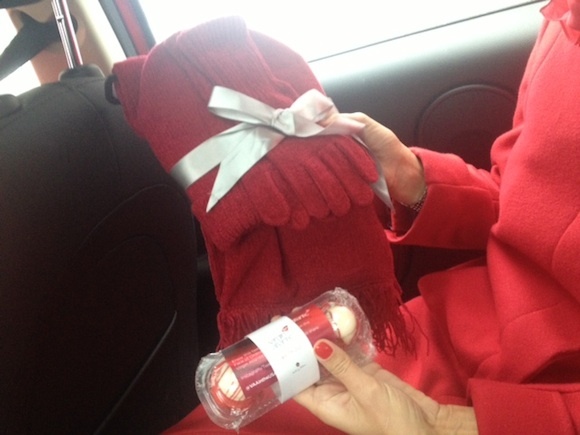 An un-ordinary gift: red mittens and a matching scarf to keep warm in the winter weather! Readers: If you get a little FITFOO love from Virgin Atlantic, let me know! Add your comments to the story. Will foodies flock to Boston for Bar Boulud?